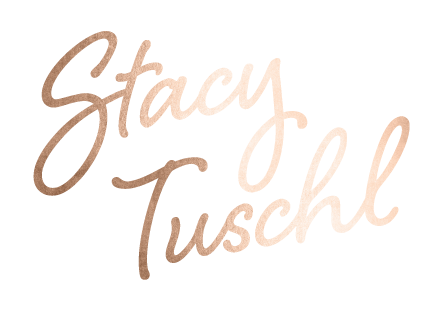 AS THESE TERMS GOVERN YOUR RELATIONSHIP WITH STACY TUSCHL, LLC. These terms are subject to change at any time and at the sole discretion of the Site owner and operator. Please visit the site regularly for updates. The trademarks, logos and service marks (“Marks”) displayed on the Entities, except user generated content, are the property of ST and other parties. You are prohibited from using any Marks for any purpose including, but not limited to use as metatags on other pages or Entities on the World Wide Web without the written permission of ST or such third party which may own the Marks. All information and content located on the Entities is protected by copyright. You are prohibited from modifying, copying, distributing, transmitting, displaying, publishing, selling, licensing, creating derivative works or using any Content available on or through the Entities for commercial or public purposes. Unauthorized use of ST may give rise to a claim for damages and/or be a criminal offense. The Entities may post or provide links to other websites by allowing you to leave these Entities to access third-party material or by bringing third-party material into the Entities via “inverse” hyperlinks and framing technology (a “Linked Entities”). ST has no discretion to alter, update, or control the content on a linked websites. The fact that ST has provided a link to a website is not an endorsement, authorization, sponsorship, or affiliation with respect to such website or its owners. There are inherent risks in relying upon, using or retrieving any information found on the internet, and ST urges you to make sure you understand these risks before relying upon, using, or retrieving any such information on a linked websites. Thank you for advance in commenting on or about the Entities. That said, we do not regularly review or consider any unsolicited creative submissions or suggestions for any of our products or services. This is for a specific reason. We want to avoid the possibility of future misunderstandings in the event that ideas developed by our staff might seem similar to the ideas submitted to us. So please do not send us any original creative ideas, suggestions, materials or anything that may be considered your intellectual property. To the extent you send any of this information, you hereby grant us an irrevocable license to use this information as we see fit, including but not limited to commercial purposes without monetary payment or attribution. We will not treat any communications as confidential unless we have agreed to a specific written confidentiality agreement. Further, you hereby waive all rights against us for any use or disclosure of any information submitted to us. Indeed, we will treat unsolicited submissions of our property. Accordingly, submissions to the entities will be at your own risk and if you believe that discretion is advised when making submissions. ST does not endorse and is not responsible for (a) the accuracy or reliability of an opinion, advice or statement made through the Entities by any party other than ST, (b) any content provided on linked websites or (c) the capabilities or reliability of any product or service obtained from linked websites. Other than as required under applicable consumer protection law, under no circumstance will ST be liable for any loss or damage caused by your reliance on information obtained through the Entities or a linked website, or your reliance on any product or service obtained from a linked website. It is your responsibility to evaluate the accuracy, completeness or usefulness of any opinion, advice or other content available through the Entities, or obtained from linked websites. Please seek the advice of professionals, as appropriate, regarding the evaluation of any specific opinion, advice, product, service, or other content. The information, software, products and descriptions of services published on the Entities or a linked website may include inaccuracies or typographical errors, and ST specifically disclaims any liability for such inaccuracies or errors. ST does not warrant or represent that the content on the Entities is complete or up-to-date. ST is under no obligation to update the content on the Entities. ST may change the content on the Entities at any time without notice. ST may make improvements or changes to the Entities at any time. It is your exclusive obligation to maintain and control passwords to your account. You are exclusively responsible for all activities that occur in connection with your user name and password. You agree to immediately notify ST of any unauthorized uses of your user name and password or any other breaches of security. ST will not be liable for any loss or damages of any kind, under any legal theory, caused by your failure to comply with the foregoing security obligations or caused by any person to whom you grant access to your account. All promotions are subject to the terms and conditions as shown on these Entities. We reserve the right to limit quantities purchased. All promotions are for a limited period, and the dates covered by the promotion are listed on these Entities. Various promotions have minimum requirements. Those requirements are set forth as part of the online promotion description. When calculating the minimum purchase amount, we do not include charges for shipping, handling or the applicable tax. All orders placed through the Entities are subject to ST’s acceptance. This means that ST may refuse to accept or may cancel any order, whether or not the order has been confirmed, for any or no reason, and without liability to you or anyone else. If your credit card has already been charged for an order that is later cancelled, ST will issue you a refund. Any information contained in or made available through the Entities does not replace or substitute for the services of trained professionals. For instance, financial, medical, psychological, or legal matters are not meant to be helped or solved on the Entities. If you have symptoms that may need medical attention, you should immediately consult a doctor. We and our licensors or suppliers make no representations or warranties concerning any treatment, action, or application of medication or preparation by any person following the information offered or provided within or through the Entities. Neither we nor our partners, or any of their affiliates, will be liable for any direct, indirect, consequential, special, exemplary or other damages that may result, including but not limited to economic loss, injury, illness or death. You alone are responsible and accountable for your decisions, actions and results in life, and by your use of the Entities, you agree not to attempt to hold us liable for any such decisions, actions or results, at any time, under any circumstance. “User Generated Content” is communications, materials, information, data, opinions, photos, profiles, messages, notes, website links, text information, music, videos, designs, graphics, sounds, and any other content that you and/or other Entities users post or otherwise make available on or through the Entities, except to the extent the Content is owned by ST. The Entities contains services and features that are available to certain mobile Devices. Your carrier’s normal rates and fees apply. Not all mobile services will work with all carriers or Devices. By using ST’s mobile services, you agree that we may communicate with you by electronic means to your mobile Device and that certain information about your use of these services may be shared with us. If you change or deactivate your mobile phone number, you must promptly update your account information to ensure that we don’t send your messages to a different person. All products and services connected in any way to the Entities are for educational and informational purposes only. No information on any of the Entities is a promise or guarantee of results or future earnings, and the Entities do not offer any legal, medical, tax or other professional advice. Any information provided by the Entities is conceptual and should not be taken as promises for actual or future performance. Starting and operating a business is inherently risky. Decisions based on any information presented in our products, events, services, or web site, should be done at your discretion and only with the knowledge that you could experience risk or losses as a result of your decisions. Always consult your accountant, lawyer and/ or professional advisor before making decisions related to the Entities products or services for your business or finances. You alone are responsible and accountable for your decisions, actions and results in life, and by your registration here you agree not to attempt to hold us liable for your decisions, actions or results, at any time, under any circumstance. The Entities are not a way to “get rich” quickly. There—normally—is no such thing. The Entities were created to help you build your business. As with any endeavor, building your business requires a tremendous effort from you personally. The Entities are meant to help focus and support your work, ideas, and service. Accordingly, we cannot and do not make any guarantees for your results. The Entities are focused on helping by providing content, direction, and strategies. We are confident that the Entities can help and give you a 30-day 100% satisfaction guarantee. If you are not happy for any reason with the quality of our training, just ask for your money back in writing. Users of the Entities agree that the tools, processes, strategies, materials and information presented on the Entities are copyrighted and proprietary, so users agrees not to record, duplicate, distribute, teach or train from our information in any manner whatsoever without our express written permission. Any unauthorized use or distribution of our Enities proprietary concepts, materials, and intellectual property by you or your representatives is prohibited and ST will pursue legal action and full damages if these terms are violated in order to protect its rights. ST is not responsible or liable for any User Generated Content or other Content posted on the Entities or for any offensive, unlawful or objectionable content you may encounter on or through the Entities. The Entities, User Generated Content, Content, and the materials and products on this Entities are provided “AS IS” and without warranties of any kind. To the fullest extent permitted by law, ST disclaims all warranties, express or implied, including, but not limited to, implied warranties of title, merchantability, fitness for a particular purpose and non-infringement. ST cannot guarantee and does not promise any specific results from use of the Entities. ST does not represent or warrant that the Entities will be uninterrupted or error-free, that any defects will be corrected, or that this Entities or the server that makes the Entities available are free of viruses or anything else harmful. To the fullest extent permitted by law, ST does not make any warranties or representations regarding the use of the materials or Content in the Entities in terms of their correctness, accuracy, adequacy, usefulness, reliability or otherwise. You understand and agree that you download or otherwise obtain Content at your own risk, and that you will be solely responsible for your use and any damage to your mobile Device, computer system or other Device in which you access the Entities, loss of data or other harm of any kind that may result. ST reserves the right to change any and all Content and other items used or contained in the Entities at any time without notice. Some states do not permit limitations or exclusions on warranties, so the above limitations may not apply to you. ST SHALL NOT BE LIABLE FOR ANY DIRECT, SPECIAL, INCIDENTAL, INDIRECT OR CONSEQUENTIAL DAMAGES, INCLUDING FOR ANY LOST PROFITS OR LOST DATA, THAT RESULT FROM THE USE OF, OR THE INABILITY TO USE, THIS ENTITIES OR THE PERFORMANCE OF THE PRODUCTS PURCHASED THROUGH THE ENTITIES OR THE CONDUCT OF OTHER ENTITIES USERS (WHETHER ONLINE OR OFFLINE) OR ATTENDANCE AT A ST EVENT OR ANY USER GENERATED CONTENT, EVEN IF ST HAS BEEN ADVISED OF THE POSSIBILITY OF SUCH DAMAGES. YOU ASSUME TOTAL RESPONSIBILITY FOR YOUR USE OF THE ENTITIES. YOUR ONLY REMEDY AGAINST ST FOR USE OF THE ENTITIES OR ANY CONTENT IS TO STOP USING THE ENTITIES. THAT SAID, IF ST IS FOUND TO BE LIABLE TO YOU FOR ANY DAMAGE OR LOSS WHICH IS IN ANY WAY CONNECTED WITH YOUR USE OF THIS ENTITIES OR ANY CONTENT, ST’S LIABILITY SHALL NOT EXCEED US $100.00. APPLICABLE LAW MAY NOT ALLOW THE LIMITATION OR EXCLUSION OF LIABILITY OR INCIDENTAL OR CONSEQUENTIAL DAMAGES, SO THE ABOVE LIMITATION OR EXCLUSION MAY NOT APPLY TO YOU. To begin an arbitration proceeding, you must comply with the limitations provision set forth in Section here and submit the Dispute by utilizing the forms available at http://www.adr.org, and simultaneously sending a copy of the completed form to ST at the address above. Payment of all filing, administration and arbitrator fees will be governed by the AAA’s rules. Choice of Law and Forum; No Jury Trial. If for any reason a Dispute proceeds in court: (i) except with respect to a qualifying claim over a Dispute in a small claims court, you agree that any such Dispute may only be instituted in a state or federal court in Milwaukee County, Wisconsin; (ii) you and ST irrevocably consent and submit to the exclusive personal jurisdiction and venue of such courts for resolution of such Disputes; (iii) you and ST agree that the Federal Arbitration Act, the AAA rules, applicable federal law and the laws of the State of Wisconsin, without regard to principles of conflicts of law, will govern this Dispute Agreement and any Disputes; and (iv) you and ST agree to waive any right to a trial by jury. Stacy Tuschl, LLC, (hereinafter known as “Provider,” “us” or “we”) currently owns and operates the website known as www.stacytuschl.com, www.GetFocusedAcademy.com, www.IsYourBusinessWorthSaving.com (the “Entities”). To better protect your privacy we provide this notice explaining our online information practices and the choices you can make about the way your information is collected and used. To make this notice easy to find, we make it available on our homepage and at every point where personally identifiable information may be requested. If you wish to be removed from any postal, email, phone, or other lists, please let us know by emailing us at [email protected] or for electronic communications, using the applicable link to unsubscribe. You can also write us or call us at the contact information above. Please provide us with your exact name, email address, mailing address, and phone. We will be sure your name is removed from the appropriate lists immediately. As part of our practices to better serve our customers, we or our authorized technology services provider may also collect certain technical and routing information from you. This information helps us administer the Entities and to improve the content for our users and how the Entities are being. This information is collected without identifying you or any user individually. ST may use this aggregate, non-identifying statistical data for statistical analysis, marketing, or similar promotional purposes. The Entities use “cookies” to help you personalize your online experience. A cookie is a text file that is placed on your hard disk by a Web page server. Cookies cannot be used to run programs or deliver viruses to your computer. Cookies are uniquely assigned to you, and can only be read by a web server in the domain that issued the cookie to you. You have the ability to accept or decline cookies. Most web browsers automatically accept cookies, but you can usually modify your browser setting to decline cookies if you prefer. If you choose to decline cookies, you may not be able to fully experience the interactive features of the Provider services or Entities you visit. When you register, Provider will not share your information with third parties without your permission, other than for the limited exceptions listed below. It will only be used for the purposes stated above. We use personal information to reply to inquiries, handle complaints, provide operational notices, keep records up to date to notify you via periodic e-mails of technical service issues, specials, or other related product/service information. Your information may be shared with agents or contractors of Provider for the purpose of performing service for Provider. Provider may disclose your personal information if required to do so by law (for example, a subpoena) or regulation, or in good faith to (a) comply with legal processes served on the site, or (b) protect the rights and property of Provider, or (c) where our records indicate fraudulent activity or other deceptive practices that a governmental agency should be made aware of, or (d) where your communication suggests possible harm to others. In the event of an attempted breach of the security of the Entities, or a physical or property threat to you or others. The online registration at Provider is designed to give you options concerning the privacy of your credit card information, name, address, e-mail and any other information you provide us. Provider is committed to data security with respect to information collected on our site. When collecting or transferring sensitive data such as credit card and personal information, all of our processing and security is performed through Ontraport, which has its security. More information can be found at www.ontraport.com. Credit card numbers are only used for processing payment and are not used for other purposes. Our efforts to protect credit card fraud help protect your financial data security. You specifically waive and release all rights and remedies against us for any claims that arise out of Ontraport’s conduct or system. Our Entities are not setup to track, collect or distribute personal information. Our Entities do generate certain kinds of non-identifying usage data, such as number of hits and visits to our sites. This information is used for internal purposes only. The statistics contain no personal information and cannot be used to gather such information.